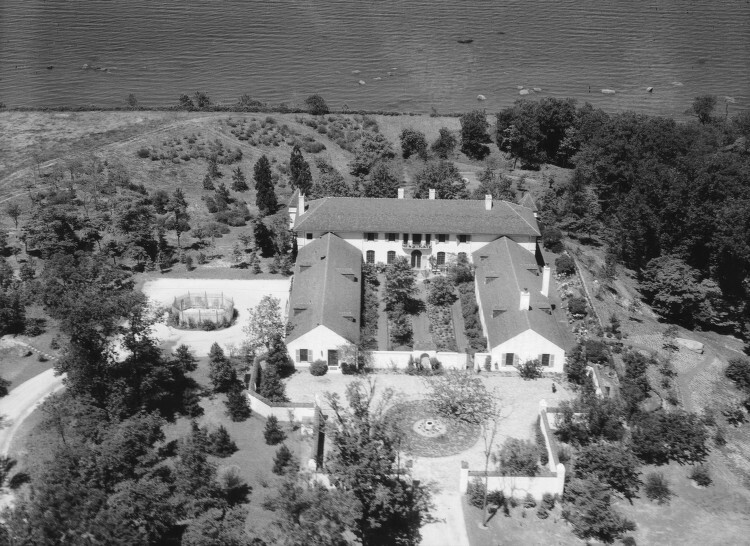 'Mille Fleurs', the Florence Guggenheim estate designed by Polhemus & Coffin c. 1932 in Sands Point. 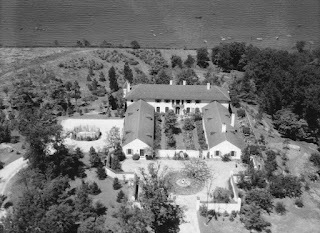 Guggenheim moved to 'Mille Fleurs' from 'Hempstead House' following the death of her husband Daniel. The house is currently owned by Nassau County, click HERE to see 'Mille Fleurs' on google earth and HERE on bing. This aerial is part of SMU's Robert Yarnall Richie collection and was taken between 1932-1934. An most unattractive house with two chicken coops extending out from the front facade. Tasteless. Anyone with a copy of "Mansions and Millionaires", a 1983 publication of Arlene Travis and Carole Aronson, showing the interiors and house at eye level as they appeared in 1935, will agree that Mille Fleurs was neither unattractive nor tasteless. I get the simple French country estate feel and hopefully P&C's intent, but it seems a bit contrived and sadly it does seem more akin to being grooms quarters. Nothing wrong with that but its been done far better. From the aerial view the design looks far from seamless with the two wings. So were they originally part of the design or added later as means to have a more accessible garden for Mrs. Guggenheim? It doesn't look like the intent was ever to have this U block with a forecourt for arrivals. A bit too narrow for that with the design. Further by creating this enclosed area the property most likely wasn't intended to be a large entertaining place. I say that as its rare that a host would expect guests to arrive, but walk a fair distance through a garden to the main entry. Or am I mistaken and arrivals expected to enter from the side court? The pictures from the Nassau County Department of Assessment do show more detailed brickwork thank I expected. What a really nice way to down size after you give up the main house later in life. The link provides some views of the home which has a wonderful facade overlooking the water. Restrained and elegant. I think Nassau County rents this as well as Hempstead House for weddings, etc., but you cant help but notice that all the structures at the preserve have seen better days. A nice set of exterior and interior photos found on flickr. A lot to like about the design. I would happily live there, though I'd simplify the walled garden and have only two rows of apple trees and little if anything else. The house is a nice downsizing after a living-large existence, as a previous individual commented. The only architectural change I would make is on the ground floor, inside the walled garden: It needs masses of French doors. Sweet country house which still is quite large in comparison to most others. Very satisfying interiors based on the photos. I too think the courtyard could use rows and rows of glass doors. I could see this in Provence - like Chinon, tons on rosemary and herbs in garden, floor to ceiling glass all three sides. That'd be fantastic.